Hacks Page - A collection of small pages and photos of projects collected in one place. hi res built in camera, the web cam on the display side works fine though. Memory Stick Slot - I am trying out the alpha version of the TI driver from BerliOS. See below Memory Stick. It seams to drive up the load when running. I am now (May 2009) using a Tac-Eye from Vuzix. Here are a few quick shots of how I have it mounted on my glasses. It blocks more vision than the microoptical, but gives a bright, large, colorful 800×600 display. The way I have it mounted it is not ideal. Sometimes I am unable to see the inside edge of the display. I hope to dedicate a pair of frames to this display and get that worked out, but as it is it works well enough that I have not been driven to solve that problem yet. Since May of 2009 I have been using the Tac-Eye 800×600 display described above. Here is my old description of the microoptical. Xubuntu looks great on the sony's 1024×600 display. 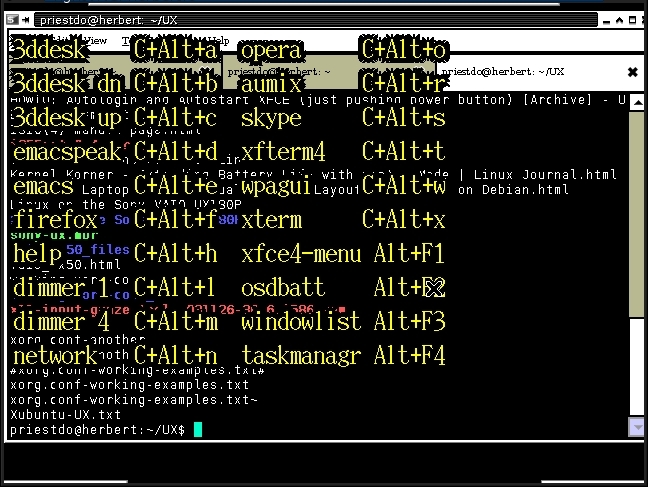 However when I wear I am using a 640×480 display which is always going to look crowded with any modern window manager. Even more so when you make things large enough to see quickly while wearing (and trying not to walk into a tree). You have been warned. 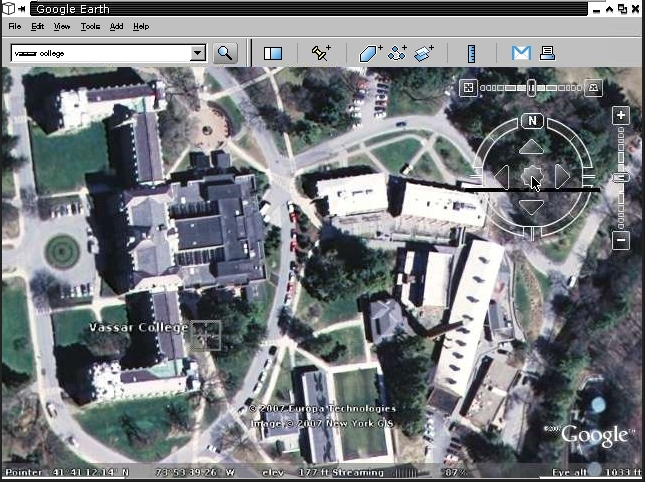 Here is a cluttered screen shot of the 640×480 microoptical in xubuntu displaying the overlay of my keyboard shortcuts, one of emacspeak with my top pull down panel and finally googleearth of Vassar College. Like I said, 640×480 in all it's glory. But I have tried 800×600 displays and so far they take up too much of my visual field of view. Perhaps someday we will have a good alternative. :: Well, after two decades of explaining that I have many uses for my wearable which don't require a full time network connection, I have finaly gone and orded a 3g connectivity plan. The modem has decent power consumption specs, Transmit: max 650mA, Idle: max 115mA. So, leaving it plugged in all the time would mean I raise my base power consumption by 0.6w/hr. 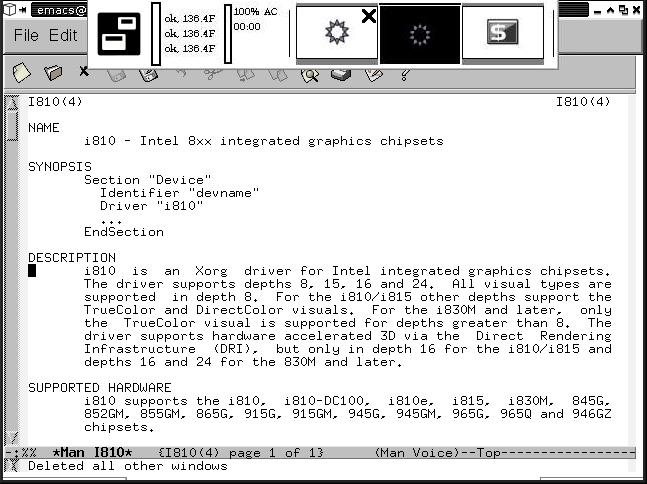 : Initial and setup required an os other than linux, but once done it has been working quite nicely with pppd. :: May 2009 I have moved from the 640x480 4bit Microoptical to an 800x600 full color Tac-Eye. I am still working trying different mounting options. So far I am quite pleased. : I am trying to change the mount on it a bit to better work with my glasses and my useage patterns. One idea is to try to make an alternate post and ball that I'm thinking of attaching directly to my glasses (well, the frames). Alternatively, I'm thinking about changing the screw down setup they have for something spring loaded so I get a device I can easily place and remove onto my glasses. I am finding I want that as the tac-eye is larger than the microoptical and sometimes don't want it occluding my vision as much as it does. :: 8.04LTS xubuntu upgrade. It went very smoothly. :: As of today Friday, Jan. 4th 2008, the Spiffchorder is fully working. My 14 year search for a keyboard that does exactly what I want is over! Build one yourself and see. :: I am very happy to say that I am back to using my 7 button chording keyboard. Thanks to Mikkel Holm Olsen it no longer requires a special kernel driver. It is now seen as an HID compliant usb keyboard! The code is not quite polished enough for public release, but very soon now. :: So what was the upshot of my [[http://www.handykey.com|twiddler]] experiment? Well, I tried it for many months. For me it does not work well. The twiddler is a nice device for many reasons - built in mouse, lots of keys you can program, fits neatly in your hand and not least of all you can put down your money and have a working keyboard sent to you! ..But on the last day I used it my speed was still under 15 wpm. I am told that this is not typical, but then I never said I had a neuro-typical brain. So, I put my seven key chorder back on (after not using it all those same months) and did 55 wpm. My brain and fingers work better with my hand open and with fewer buttons. Mikkel is cleaning up the code, I am trying to help with the documentation and then it will be posted for folks to build their own. :: The denim bag I had been using has been replaced by a holster. On the right side is a pocket that holds the battery, now a battery geek BG 14-18-88 (88.8Wh) which gives me around 10 hours of run time. On the left side is the sony, the keyboard dongle, the usb hub and dongle for the display. There is no longer a strap across the front as this balances well and stays in close to my body without one. .. A = Sony UX280P, B = Battery Geeks Battery pack, C = [[chorder>spiffchorder]] D = Jabra BT500 Headset, E = MicroOptical on a magnetic mount, F = MicroOptical Battery pack modified to run off USB power, G = sony VGA adapter, H = usb hub providing power to the MicroOptical, charging for the BT500 and connection to the spiffchorder. :: At the time of this writing (Spring, 2009)I have been wearing Herbert in this holster for well over a year. It is by far the most comfortable way to wear I have found. Still, occasionally I do the cargo pants thing. I have also moved to wearing Herbert on the outside of my shirt as the standard. In this post 9/11 world, it seems better to look geeky than to look like you are hiding something strapped to your body. So, the current standard is over the shirt. Perhaps if we calm down a bit as a country, I will go back to wearing it under my shirt again. :: Recently I replaced the front of the lower right pocket on a pair of cargo pants with mesh, added button holes for passing cables to the pockets and put Herbert in my pants. Battery was in left lower pocket. Herbert in right lower pocket. USB hub and keyboard dongle in the right upper pocket. It was nice not having anything on my upper body but as the pants are by design a little loose fitting in the leg the battery and rig swayed about a bit more than I liked. I have gone for long walks this way, but I would prefer not to do so. I would defiantly wear this way on a day I would be sitting or not running around much. Driving is fine as well. Perhaps conference or meeting days. But in general, I move more freely with the holster. ::I have tried using a bluetooth headset with mixed results. The headset performs well, but the speech server I am using in emacspeak keeps the connection up at "talk" level even when not speaking. As a result I only get 8 hours of time from the headset. I can not use it all day without recharging it part way through or shutting down the speech from emacspeak. It is however quite convenient so I have been finding ways to use it and trade off when I need to charge it. It is pictured above  next to my glasses in the entry on the MicroOptical Magnetic mount. ::On Dec. 9, 2007 I did the 7.10 xubuntu upgrade. It went very smoothly. Not much more to say about it. :: I have again installed the latest alpha (from svn) of the TI Memory Stick Slot driver available at [[http://openfacts.berlios.de/index-en.phtml?title=TI_FlashMedia_xx12/xx21_driver]]. The stick has consistently worked with the alpha driver but when in use my load never drops below a 1. I am running some other tests to see what that number is actually indicating. If power use is not increased than it is still likely a win to use the memory stick for a file system in order to keep the hard drive quite more of the time. Time will tell. ::Well, a few months back I upgraded to 7.04. All went smoothly except for 2 things. The problem is, I don't remember one of them, I only remember I was upset but figured it out quickly. So, if you do the upgrade on a UX and something goes wrong, write me and tell me what it was. I can then tell you if it was the same thing that happened to me and being reminded, what I did to fix it. I will then post it here and thank you (if you like). The //other// thing that the upgrade messed up was my wireless setup. It would auto associate to a weighted list of hosts right from boot. It still works most of the time, but since the upgrade once in a while I need to ifdown eth1 then ifup it again before it kicks in. As it usually still works and I don't reboot that often I have not tracked this down yet but will soon. I would guess it is a startup sequence issue. ..Since the upgrade I installed r5u870-0.10.0 from [[http://lsb.blogdns.net/ry5u870/]] it built with out a hitch and now the webcam (the one facing you if you are typing) works as others have also reported. Not sure how to use this feature as the camera is usually inside my clothes and it's dark in there. But it may come in handy as a videophone. ::I got a nice little usb based gps receiver, the GlobalSat BU-353. Worked out of the box and I have been having fun with it. I got lost in Boston heading from ISWC in a rental car during rush hour traffic and thanks to roadnav and the gps I was able to get to my destination (a friends house I had never been to before) without a scratch. ::Necessity forced this one. I recently had an eyeware prescription change and in the process lost the eyeglass connector for my Microoptical, so I did the tiny magnet hack that Thad and Dan did several years ago. .. There are magnets hot glued to my eyeglass frames and to the metal mount on the MicroOptical. The mount is made from an bit of metal cut out of a plate sold for putting wall outlet boxes into sheet rock. :: I have opened up the Sony VGP-PRUX1 Port Replicator. I hope to get the components of it into the next vest reducing the cabling and allowing me some expansion. I should have pictures posted in the near future. The goal is to be able to take Herbert out of the vest/holster or put it back in and only have one plug to deal with when I do. The power, sound, display and attached usb devices all being connected through the hacked dock... it's a dream I have. .. Well, even with the dock cut down, it is larger than the vga dongle and a 4 port usb hub. So, at this point I am not incorporating it into the vest/holster. The size is not worth the added convenience. This one is made more from COTS products than anything I have worn since the late 80's. I have been wearing the Sony UX280P for a month now. It is performing wonderfully. The rig consists of a Sony UX280P running Xubuntu Linux (6.10). A 60 W/hr. external battery, theBG 14-18-60 Laptop Batt ery from Battery Geeks, a Microoptical display that seams to no longer be available, and a slightly modified Handykey Twiddler. I currently still prefer my 7 key chorder to the twiddler , I really want to give the twiddle a full blown trail, so I am committed to running this rig with a twiddler for now. (But if I am not past 20wpm soon I might change my mind on this point.) I will likely move from the Microoptical to an M1 RS 170 from Tekgear once I g et the ntsc out working. As configured I am getting between 9 and 11 hours of run time with the 60W/hr and the sony 20W/hr o n the rig. Add 3hrs to that if I use the larger (40W/hr) sony battery instead or 6hrs if I swap sony batteries over the cour se of the day. Installation was a breeze, first get into the bios and tell the machine it can boot from an external device. To do this pres s Function key and click the 2 key (to generate an F2 key). You may have to do this a few times to get the hang of it. Eventually you get the bios screen. There you have to change not only the boot order but also on another screen you must enable external devices for boot. (This process is also described by Rudra) Then, plug in a usb cdrom. I did not have one but I plugged a regular IDE dvd drive into an external hard disk usb2 adapter and it work ed fine. Put in the install disk of your choice and go. I decided to back up the existing disk using partimage and a copy of the mbr before wiping the drive clean and installing Xubuntu. I saved the images over the wireless connection. Eventually I will make a vest, but for now I am wearing in a rectangular bag that I have used for other rigs in the past. It wraps about three quarters of the way around me. The Sony is on my left side, the universal battery and microoptical display battery/controls are on the right side, cables run across my back all contained in the bag. Rig + battery + display + twiddler = 3 pounds, with current bag, strapps and existing cables 4 pounds 2 oz. I could trim that down by making some dedicated shorter cables. I made a small tray made of thin plastic (cut with utility knife, heated and bent over the kitchen stove) shaped to hold the UX280P and ensure the paths to its ventilation would stay open. The silver edge visible in this photo is the top of the device. The silver edge in this photo is the bottom of the device. The black foam supports the various plugs to minimize strain on the unit. All strapped in, ready to go into the bag. Yes, it's small! This bag has been used with several different wearables and has become my default test bag. It does a very good job of putting the weight right where I want it. Now the bag gets closed up (the grommets are from an earlier use of this same bag and serve no function now) The middle section of the bag (folded in picture) carries cables only. A page like this, by it's nature is egotistical, “look at all this stuff I made”. Even a “Thank You” section has that problem “look at all the cool people I know”. None the less, there are others who need to be mentioned as my work has been influenced and informed by the work, conversations, experience and postings of others. To even try means leaving folks out and this section is by no means complete, but it has to start somewhere and writing is a temporal endeavor so here goes. It all starts with Thad Starner. Thad and I met on the net at I time when I had no idea anyone else was doing this kind of thing, somehow I fumbled onto the wearhard list and met Thad. There I learned that there were other folks who, like me, were strapping computers to themselves and using them that way by choice, it even had a name - Wearable Computing. It was through Thad I made my way to the first ISWC in 1997, and there met Adam Oranchak, Doug Platt, Steve Mann and a whole community of borgs back in the mid 90's. I have been fortunate enough to be in the same place at the same time as a few of these folks now and again and while I have always found our time together far too brief it has none the less been deeply meaningful. At ISWC I also met some people who choose a life without wearing but are, none the less, still good folks - Tony Havelka has offered me his ear and advice time and again, Tomas Bass I only met once but had a truly memorable conversation with (well, memorable to me anyway), LeeAnn Voisinet I have lost touch with, if anywone knows how to reach her, please kick her my contact info and let her know I would love to say Hello. On the list for inclusion here: Dan Ashbrook, Aaron Tony, Lou Voerman, Jinnah Hosein, Mikkel Holm Olsen. This page describes the rig I wore until fall 2011.